The Cardinal Flower is a member of the Bluebell or Bellflower Family. The plant grows to 5 feet in height and has oblong, toothed leaves to 5 inches in length. The plant typically grows in wet areas along streams at elevations between 3000 - 7500 feet. 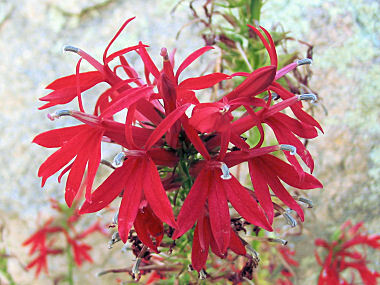 Cardinal Flowers are a favorite of hummingbirds. The Cardinal Flower blooms between June and October and produces bright red, tubular flowers that grow to 1.5 inches in length and have two smaller upper lobes and three larger lower ones. The flowers grow in an elongated cluster on an upright flower stalk.